I think Cairo just likes to know what his "property" is about to do. Any facial expression I make is quickly detected. Cairo loves to stare when he falls asleep, preferably at my face. Very pretty girl you have there. I never thought it was possible. I've been over-taken, over-run. A "dog" has taken over my life. Well, not a "dog", a 'Senji. I watched the video and Cairo woke up. His head was on a swivel, guess he though he had company. Pretty girl you got there. Thanks for posting, I wish Cairo was that vocal. You reminded me of me walking Cairo. Yeeeeaaahhh Buddy!! Cairo howled twice yesterday at the fire truck! First time, that I know of. Bad part about it, I wasn't home to hear him, my mother told me about it. Oh, the pleasure is all mine. Yeah the leaves aren't in my yard, I would hate to have to keep up with them. Haven't been on in awhile, so I figured I would post a clip of Cairo on one of his daily walks. He has 3 stitches in the back of his left ear, poor little boy. He had a cyst come up on the back of his ear, little bit smaller than a corn kernel, it was bothering him. So we had it lasered off, its a little tender, but he'll be just fine. Anyway, I hope you find the clip amusing as he pees on stuff and tries to dodge leaves on the sidewalk. Wow, fantastic photos, I enjoyed them a lot. Cairo is a beautiful boy! He looks nearly exactly like my girl, Shaye - so of course he is the best looking guy around. Lovely pictures - he's a very smart boy. I agree (and he does also) that he is great looking boy. Very smart as well. Me and my parents joke around all the time, saying that he is a celebrity around our town. Everywhere I take him, people go out of their way to see, pet, and inquire about him. Cairo's doctor said she only knows of one other Basenji in our area, I have yet to see. Such a basenji! Hovering to wait for food to drop. He's a good looking boy! He is a master at beating us to anything that "I want what you're eating" touches the floor. I think B's take the best photos, super inquisitive. Don't know where my PIC (Partner in Crime) has been all my life. 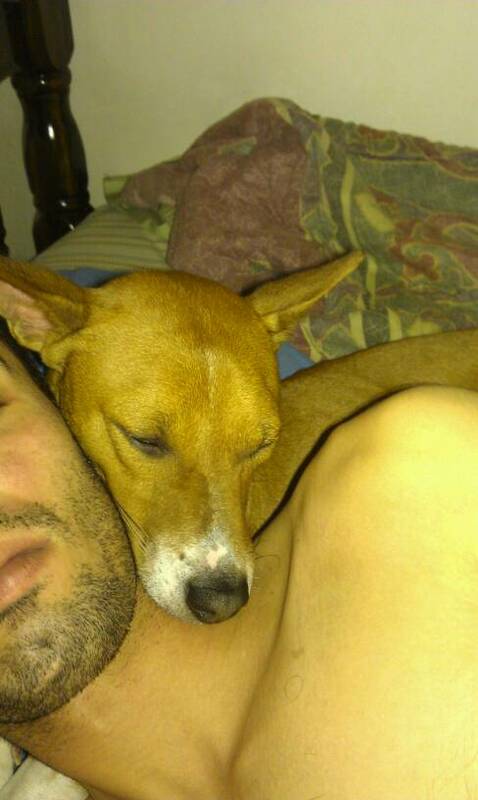 I haven't been hangin' out here much lately, but my boy is a constant reminder of Basenji. Heres a few new pics. Yeah, he did that to the couch handle when he was younger. Hoping my dad will drop a crumb.